Please join us in Local Matters on Sat. 18th Nov. 2017, at 14:00. We’d like to celebrate our achievements with you, and discuss how we can move forward together. The afternoon’s event will also include our AGM. We’ll kick off with introductions and a review of the past year, and then the floor is yours. The formal notice of our AGM is here. 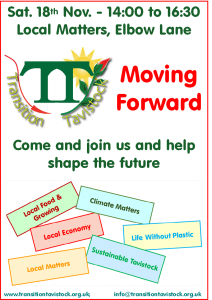 If you’d like to get involved in the coming year by helping shape and supporting our future; joining the Committee or volunteering, come along on Saturday or drop us an email to info@transitiontavistock.or.uk. This entry was posted in Events/Meetings, News, Uncategorized on November 10, 2017 by Transition Tavistock.